It’s here! Download Internet Explorer 9 Now ! 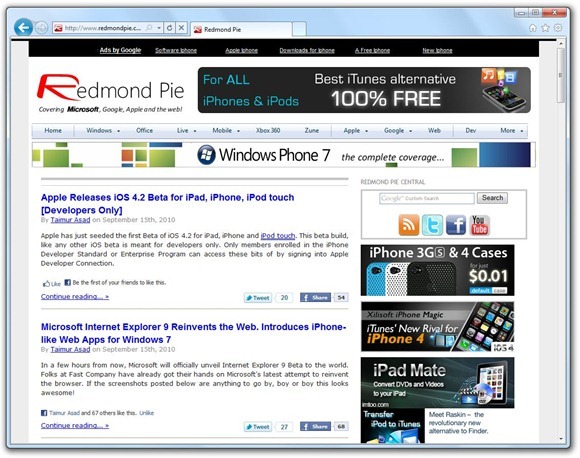 Internet Explorer 9 introduces tons of new features, including the new option to pin web apps on Windows 7 taskbar, full support for HTML5 standard, graphics rendering on the GPU level via Microsoft DirectX technology, completely revamped UI and more. More details, along with screenshots can be found here. In all fairness, do give Internet Explorer 9 Beta a decent shot and let us know your verdict on it in the comments section below.